As with most Barnes & Noble College partners’ campuses, that understanding of what was important to the University of California, Irvine was crucial in winning trust and building an important partnership. With a growing student body of over 33,000; an unparalleled academic record along with achievements in research, student affairs and co-curricular learning; UCI had a deep commitment to their existing bookstore operation, but they were also looking for something more. “Partnerships for us are really important,” says Dr. Thomas Parham, the University’s Vice Chancellor, Student Affairs, “because we understand the value of developing strategic relationships with partners who share both our values and our thirst for educational excellence.” Those values are the principles UCI was founded on — and the very reason that Dr. Parham, a class of ’77 alum, left a faculty appointment at the University of Pennsylvania, and returned to the campus in 1985 to uphold. “It’s the same now as when I was a student back then; a focus on academic excellence, a commitment to making our campus and facilities as accessible as possible, and an understanding about keeping all this as affordable as it can possibly be. That same three-legged stool has to be equally important to a strategic partner,” he says. 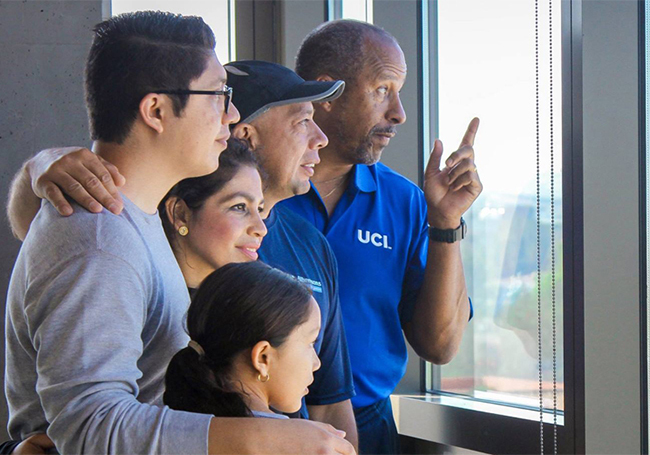 Vice Chancellor Parham shares the beautiful view of campus from the Mesa Court Towers with a new UCI Anteater family during housing move in. Central to maintaining those values has been the role of the UCI bookstore, The Hill. “It’s just an integral part of the campus,” says Dan Dooros, UCI’s Associate Vice Chancellor Student Affairs. A former bookstore director at The Hill, Dooros fully understands the challenges of academic retailing and wanted to ensure the bookstore kept abreast of them. “Technology is driving at a faster pace than an independent store can maintain, and because the academic needs here are key, we didn’t want to ever be in a situation where we couldn’t handle the needs of our students,” he says. The impact Barnes & Noble College had on affordability for the campus when it assumed management of The Hill was immediate, as Denise Nakakihara, Regional Manager, explains. 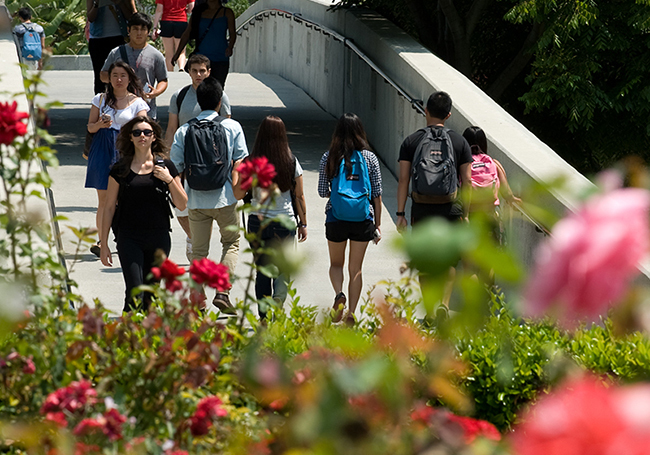 “It’s extremely important to our UCI partners that we demonstrate cost saving initiatives for students through our textbook affordability programs, and when we rolled out our Price Match program for the fall term, it saved students nearly $15,000. Combined with our rental, digital and used book programs, in total, they realized textbook savings of $488,029 for the fall and winter quarters,” she says. Those kinds of statistics provide perhaps the most measurable parts of the partnership, others, though less quantifiable, fit well into the UCI design. “We consider UCI to be a unique campus,” says Dooros, “and we really appreciate that Barnes & Noble College understands the importance of local input along with their national support.” Von Juergensonn agrees. “The decision-making for UCI doesn’t happen in our home office,” she says, “It happens right there in Irvine.” It gives Nakakihara and store manager, Stacy Weidner, the opportunity to develop new programs for The Hill, whether the challenge is successfully integrating the bookstore’s existing staff to a new operation, or building outreach programs to student services and faculty. “With 16,000 (non-student) employees on campus, we know we have only just scratched the surface in building those relationships, but we have amazing support and we’ll be intentional about connecting with the many departments and schools within the University,” Weidner says. The Hill Bookstore on the campus of the University of California, Irvine. It’s a point Dooros endorses. “It’s a destination and not just a place to buy something,” he says, expanding on some ambitious goals for The Hill this year. “There’s already a refurbishment program in place, along with an initiative we’ll be rolling out for new Student Information Systems, where we’ll be able to connect students to the books they need. These are all big issues — and they’ll make a tremendous difference,” he adds. Further strengthening the partnership is a new scholarship program that UCI developed with Barnes & Noble College to tackle the issue of literacy. 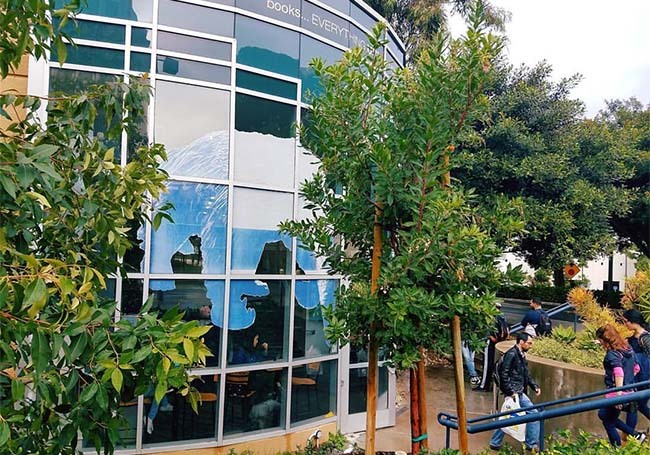 The program is an example of the “reciprocal exchange” that the UCI and Barnes & Noble College partnership has produced, where corporate profits are reinvested back into the UCI student community as a way of giving back. The students in turn will develop projects that impact the broader community inside and outside of the University. It is something Dr. Parham envisioned and an endeavor Barnes & Noble College was more than happy to accommodate. This is an example of the synergy created when strategic partners align their principles and values to make a difference in the lives of students.